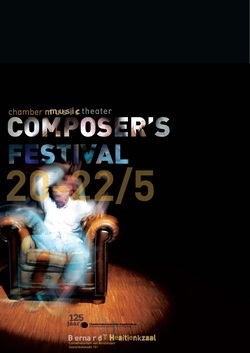 In May 2010, Rafael participated in the first Composer's Festival of the Conservatorium van Amsterdam with a setting of music, text and images simbollically named A-mestra-dam, after the homonimous text written in 2008, shortly after his arrival to the Netherlands. All music and texts by Rafael Fraga, except “Madrigal” by Eugénio de Andrade. A-mestra-dam is a setting of songs, texts and solo performance that tries to summarize my search for forms of expression that merge my artistic influences, attempting to dilute barriers and universes. Finding a personal path can be a very hard task. Musically, I have always struggled to find a personal blending of my background, rooted in popular music, and the written music of the Western tradition. I would like to express my gratitude to all the people that shared the past two years with me, namely my family, friends and teachers, in particular Willem Jeths and Richard Ayres: I believe my path is clearly at sight now, and thanks to all of them, it shows brightness and richness. A special thanks goes to the fellow colleagues that today accepted the challenge of making my music alive in this concert.